Mr Tumble has undoubtedly been one of my children’s favourite television stars. They have both sat glued to his television programmes and love joining in as much as they can. Miss M has started to grow out of him but is keen for her younger brother Mister B to have the same fun with Mr Tumble that she has enjoyed over the years. Mr Tumble’s Big Book of Counting, a new lift the flap book from Egmont arrived for us to review, and Miss M’s eyes lit up as she showed Mister B through the pages, seeing if he knew his numbers. The book teaches children to count up to 5 with each number spanning a double page with a flap that opens out to make a triple size page. Each page contains a large number image with traceable finger lines, a little rhyme and bright colourful pictures with items to count relating to the number on the page. The book also makes use of the different Tumble family characters to include, Fisherman Tumble, Grandad Tumble, Aunt Polly and more. 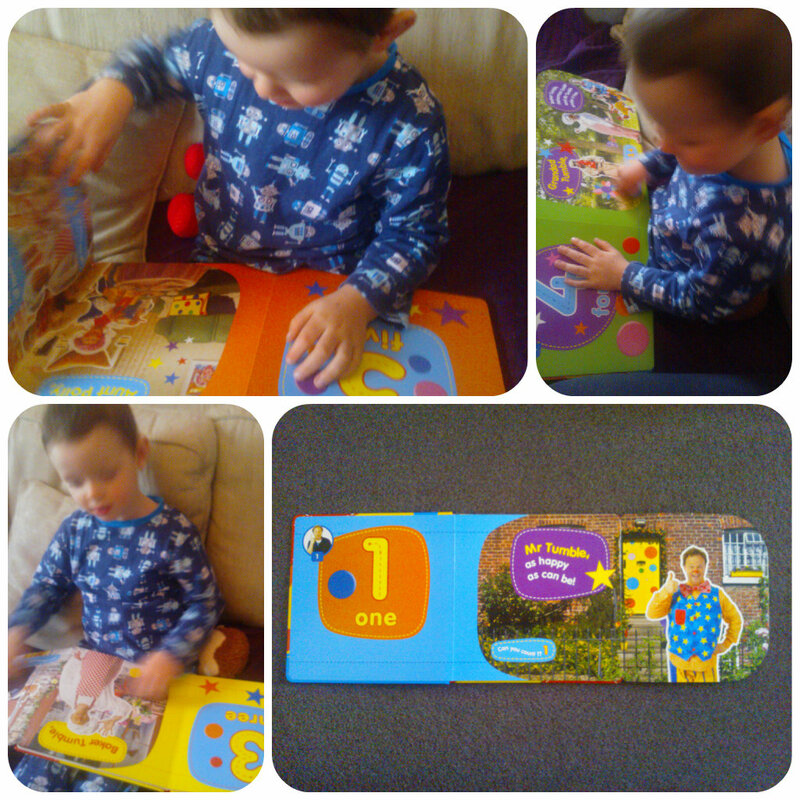 Mister B, who is 3, enjoyed the book and was able to recognise the numbers and enjoyed counting the objects. The flaps proved a hit too as he was intrigued to see what was underneath. This a large hardback book with thick card pages. 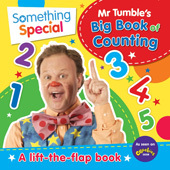 With it’s bold, bright illustrations it’s perfect for any little Mr Tumble fan out there and a great way to get to grips with numbers! All reviews are my own and my family’s opinions and we received a copy of the book in order to write the review. One of the first programmes Miss M ever started to watch was Something Special. Being primarily a programme for special needs children using the Makaton sign and symbol language at first I was unsure of the appeal but she was totally transfixed by Mr Tumble and I soon learnt of his widespread appeal among young children. It is now a character that 22 month old Mister B is very keen on and he loves shouting out for Mr Tumble whilst watching the Something Special show. It therefore comes as great news that toy brand Golden Bear Toys have released a new toy collection inspired by Something Special with Mr Tumble and friends. We received the Mr Tumble Activity Toy and Mr Tumble Phone to try. The Mr Tumble Activity Toy is a gorgeous huggable soft replica of Mr Tumble suitable for ages 10+. He was instantly a hit with Miss M and Mister B who both love taking him up for a cuddle at bedtime. By pressing Mr Tumbles hand he delights in saying one of 6 phrases such as “Hello, how are you?”, “Da Da!, do you like my waistcoat?”, “Ha Ha, I’m Mister Tumble”. Mister B found these particularly amusing and loved to copy which is great as at 22 months his speech has just started to progress rapidly and short phrases are perfect for him. He also has sensory features such as an opening waistcoat and shoe fastening that velcro’s across, along with a rattle in the feet and his nose which lights up red when he talks. My 2 loved seeing his nose light up and Miss M who insisted on taking him to bed at night found it comforting to see the glow of his nose when she pressed his hand. The Mr Tumble phone was an immediate hit with Miss M who couldn’t wait to get her hands on it when she saw it. This comes with three different Tumble character discs which can be inserted to hear various phrases upon the press of a button. She had lots of fun chatting in reply to the various phrases whereas Mister B who is younger prefered to repeat the phrases he heard. I think both the toys are excellent for any young Something Special Mr Tumble fans and will be a welcome addition to the many toy ranges out there. They are more suitable to the younger audience with Mister B being perfectly targeted to the Mr Tumble range and will have many adventures playing along with his new friend and phone! !